Two showcases this month and it's been awhile!.. 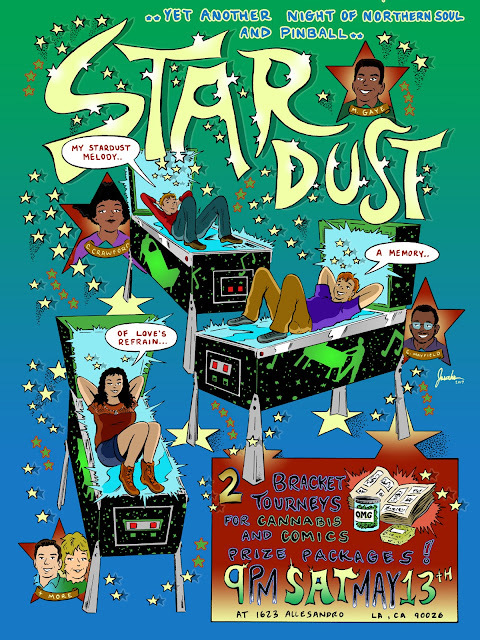 It's been quite a bit since I've shown my original comic art. I'd say, the last time could have even been 2012 or 13'... As I had a show for my release of 'THAT BIKE'. Now, coming back around to my focus on being social again : ) I've not only joined up with a good friend in Joshua Tree whom, now owns and operates a terrific Sci-Fi/Western book shop, but I've also made new friends with some businesses in the neighborhood in which I live. I'm excited for both!..As we've agreed to partner in some fun happenings all happening this June 2017. 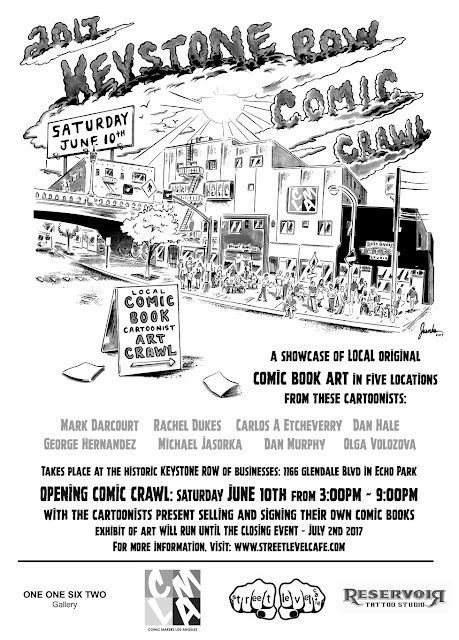 The first, is the 'Keystone Row Comic Crawl' which, will showcase members of a social group of cartoonists that I've helped organize since 2010. It's called Comic Makers Los Angeles. We have hundreds of members, but only a small lump sum come out and join the festivities of our various public meet-ups. 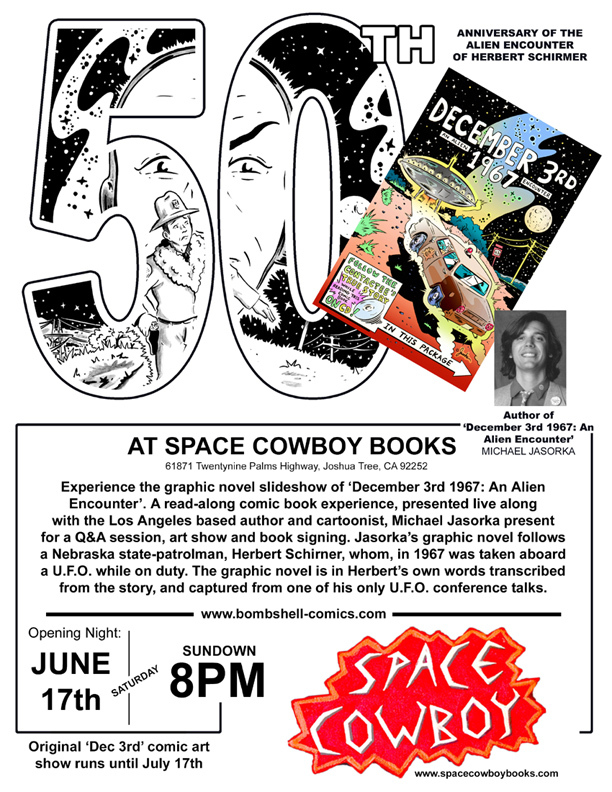 The other event, is in Joshua Tree as I've noted, at Space Cowboy Books. I'll have original comic book pages there, as well, for sale from 'December 3rd 1967: An Alien Encounter' and I'll be presenting the video experience at sundown. I'm quite excited to be putting these on. You gotta keep on keepin' on! Hey Everyone!.. It's been awhile and I told you it wouldn't be.. Forgive me. Life gets in the way. ..and boy, I've been busy. 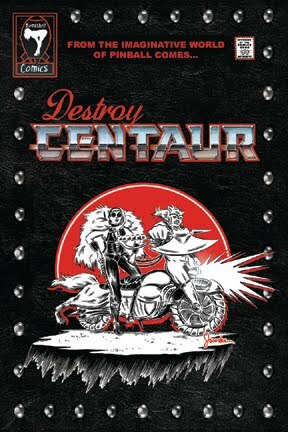 Continuing n the positive: You'll have more works to enjoy from Bombshell Comics, really soon!.. If you can believe it, i'm about to be sitting on 5 new books -- which, i'm going to slowly release - beginning this year in 2017. 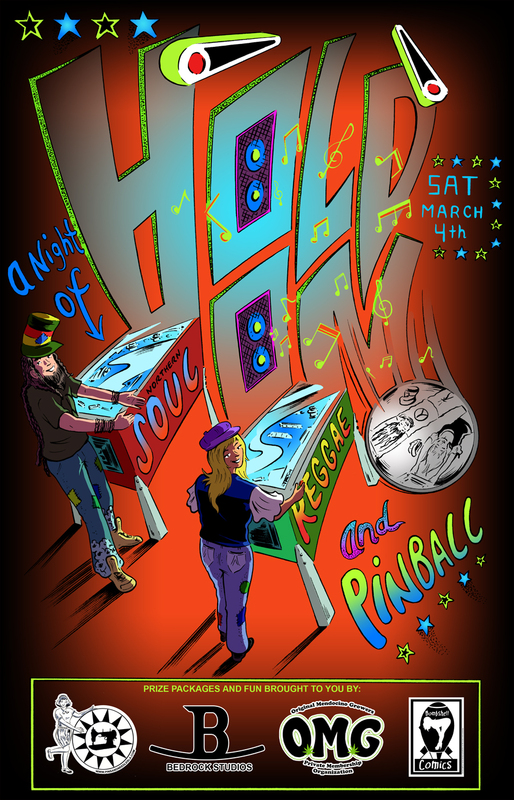 I also have a goal to release another, pinball related comic book this year. I hope I can do it for you. I'm also going to make efforts on getting more social online, again. It seems, as I've been born on this cusp of what they're calling "the millennials" i'm constantly judging my use of and/or far too much energy towards my online presence. Not sure if any of you out there feel this too, but I sure don't want to have more online memories than I do REAL ones. That's in no offense to anyone who does, I just find that the true tangible is in the reality of one-another - face to face. Though this internet and computer are marvelous tools that I use, I won't be stricken to a tool -- I'll be stricken to the application of actual pen and ink drawing. For this lifetime. Digital will always accompany my analog. 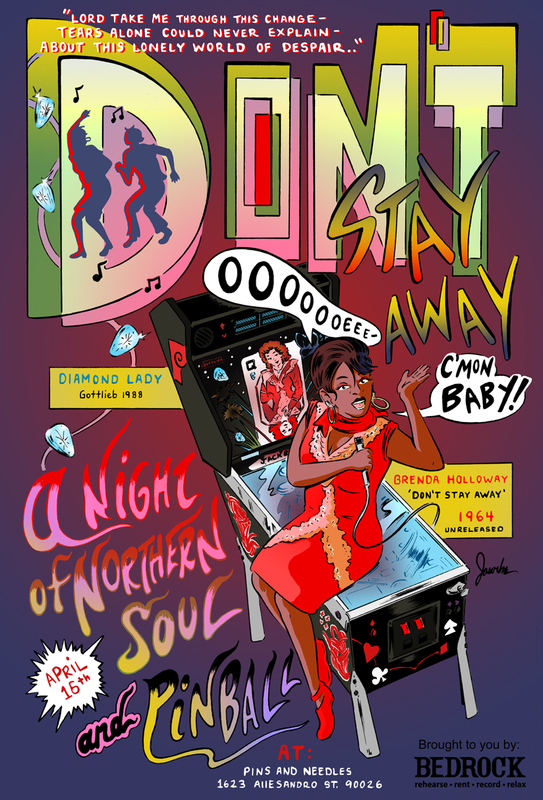 Below are are the beginnings of a collection of Northern Soul and Pinball night flyers I've produced over the years. 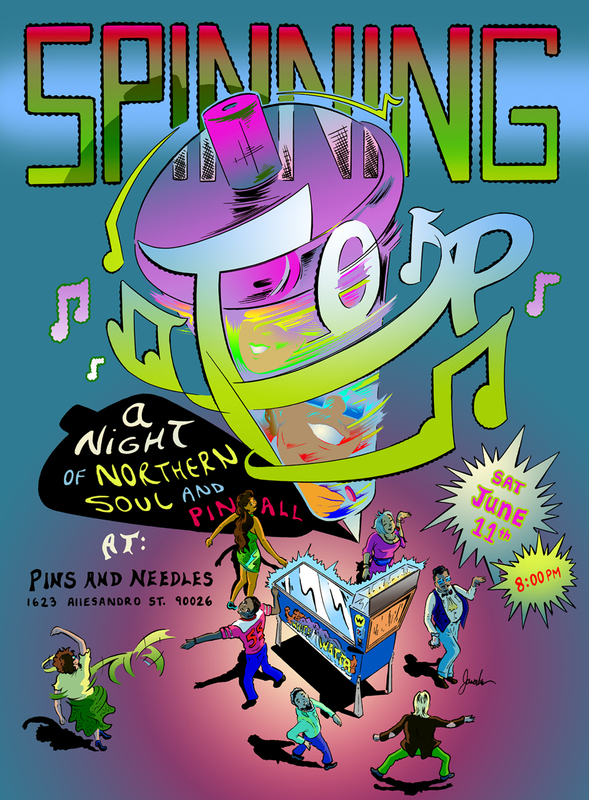 I've been proud to support two businesses I love - Pins and Needles and Bedrock Studios now, for many years. This little night we have is incredibly special and in so many ways, parallels exactly what i'm typing about, above. Hold on to your morals. The latest flyer at the top, is for tonight's event.